Make Your Own Dog Food! Food Dehydrating 101 - in case of 9-1-1 Food Emergency! Make Your Own Doggie Food + Dehydrate it! Easy to Use – Rinse First ~ Supplies Great Nutrients! Millet and Quinoa have been around for centuries. First, I'll go over Millet. It's widely grown around the world and has many uses – from nutrition to alcoholic beverages to porridge! Millet is very rich in B vitamins especially Niacin, B6 and Folic Acid, Potassium, Zinc and Calcium. When drinking isn't fun anymore, it's time to get help. When hellish hangovers hinder your work performance, make you miss precious time with your kids, or are making you into a recluse, it's time to get help. If you're sick and tired of being sick and tired and of being a slave to the bottle, it's time to get help. The protein content (11% by weight) in millet is comparable to both flour and wheat. As a kid I used to have a budgie* named Mickey who used to have millet on the sprig pushed through his birdcage bars! He'd get those seeds everywhere! (*The full name for a "budgie" is budgerigar, similar bird to a parakeet). See How Easy it is to Dehydrate Food with our Six Simple Steps! Later on in life, millet became an important ingredient in my diet. I add it to my soups and cauliflower mash. I also add millet (and quinoa) to my chicken chow dog food recipe. I do rinse the millet in a fine sifter under running cool water before use although it doesn't have the bitterness of quinoa. The photo at the top of the page is pretty much 'actual size'. I keep it in separate plastic containers for daily/weekly use. When refills are needed, I scoop it out of the b-i-g plastic bags that it ships in. It's easier for me this way. Just like millet, quinoa has also been around for centuries. Quinoa's protein content is very high – between 12% to 18%! It is a complete protein source – it contains the essential amino acids the body needs. Note: quinoa is pronounced 'keen-wah'. It is a good source of fiber, and is high in Magnesium and Iron too. The good news is that quinoa is gluten-free so it makes it easier to digest for many folk. I use quinoa in my cauliflower mash and in many soups to add an excellent source of protein. Quinoa (and millet) is also added to my chicken chow dog food recipe. Quinoa must be rinsed before use, as it has a bitter tasting coating. This is easily removed by rinsing under cool water in a fine sifter. 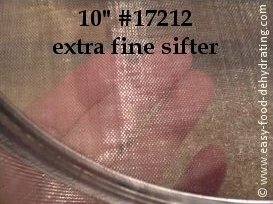 The sifter (or sieve) I use is from Fantes.com and is a 10" Stainless Steel Extra Fine #17212. Around $20. They have a 9" sifter (#18889) which would be equally as good for about $4 less. It is an excellent product! NOTE: If the #17212 is not available, the closest one to it is the #17214 which is a 12” diameter sifter for $24. We’re using “extra fine” mesh in Stainless Steel, FYI. Hey There, if you enjoyed this page, please Give us a LIKE on FB! Carrot Soup - Best Tasting -- Use Your Dehydrated Carrots for making the best soup ever! Dehydrating Zucchini -- Save Money, use our Easy Way to dehydrate Zucchini for super Zucchini Bread and Fritters! if you like our site, click below! SBI - Solo Build It! - SiteSell • Attribution to www.easy-food-dehydrating.com • Thank You!